What If You Had 100\\\s Of The Best Tested-And-Proven Low Cost - No Cost Traffic, Promotion, Training, Copywriting, Publishing, SEO, Joint Venture And Affiliate Resources At Your Fingertips Every Day - When You\\\re Busy, Don\\\t Have Time To Search, And You Need Them Most? .... And That Ain\\\t All! One of the biggest problems faced by most Internet marketers is finding good no cost/low cost resources that they can actually use to promote and expand their online business. At best (unless you know exactly where to go) it amounts to nothing less than a hassle, a waste of time, and a major loss of valuable productivity. Then there is the tedious trial-and-error where you spend even more precious time separating what works from what doesn\\\t. There is just so much crap online today, all covered with slick promotional copy, that you can\\\t tell a rotten egg from a diamond until you smell it! Even a search query on Google or Yahoo can still leave you hanging out in the wind, rummaging through trash listings and unrelated websites, in an ever more frustrating search for that one resource, tool, or bit of information you desperately need right away. Sound familiar? Oh yeah, we\\\ve all done it. And I\\\ve been there an done that too! That\\\s precisely why, some years ago, I started putting together my own Internet marketing \\\rolodex\\\ - so I could have quick access to the stuff I needed daily to run my business and stay on top of the curve. And before now, I\\\ve kept my rolodex extremely private and very secure - like the family jewels - almost as secure as my opt-in mailing list! After all, it really is worth gold in terms of the time-saving benefits alone - not to mention providing me a permanent access to some of the best \\\behind-the-scenes\\\ no cost/low cost tools and resources available. So why the heck should I share those resources with anyone else? I found them .... and I did all the brain busting research! I did the time consuming trial-and-error! I own the sweat equity! Right .... blah blah blah. Okay .... until recently that was my attitude. Maybe I\\\ve had a spiritual awakening, or maybe I\\\m just getting soft in my old age .... but lately I\\\ve came to believe it\\\s a poor attitude to have and an especially poor one to hang on to. You see, I really have built my business around being personally accessible and helping others - being free with personal assistance, advice, consulting - even coaching people who had never spent a nickel with me - but still, I\\\ve been rewarded for all that many times over. So why was I being so selfish with my resource listings? I\\\m pulling out all the stops .... throwing back the curtain .... opening up my secret files and revealing once and for all the results from six years of teeth-gritting brow-sweating searching and researching for online business resources that provide real value at little to no cost. And like I said, I\\\m going to reveal to you every single no cost / low cost \\\secret\\\ resource that I\\\ve discovered for myself in the last 6 years of doing business online. No holds barred .... nothing held back. You\\\ll get an exact copy of my own private eBUSINESS ROLODEX. But I didn\\\t stop there - I\\\ve gone one step farther for your benefit! So you\\\ll get to eyeball (and use!) online tools, services, training tutorials and other downright useful stuff that took me years to collect and try out. Finally .... in one convenient .pdf file, you\\\ll have instant access to all the tested-and-proven Internet marketing tools and resources you\\\ll ever need, right at your fingertips when you need them most. I\\\LL LET YOU GIVE IT AWAY TOO! You can blast your opt-in mailing list to the next level by offering eBUSINESS ROLODEX as an incentive to new subscribers. This high value resource will have them knocking down your doors! You can share eBUSINESS ROLODEX with your friends, customers, and most of all, with your prospects. They will appreciate the gift and you\\\ll gain instant recognition, credibility, and customer loyalty. You can include eBUSINESS ROLODEX in your own product packages or as a bonus to your other offers. The high perceived value can be the difference in making that skeptical visitor click the order button! 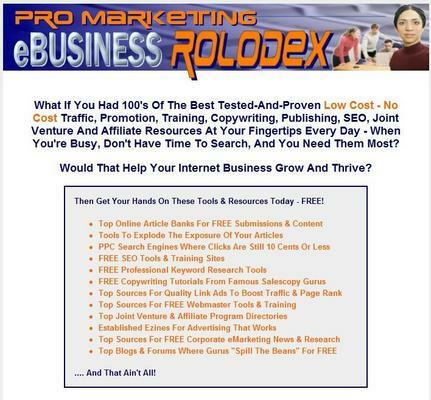 I\\\ll be happy to give you a free copy of eBUSINESS ROLODEX plus a copy of this webpage and graphics .... and let you use it to build your opt-in mailing list, give it as a bonus, and pass it along to all your own customers and prospects. They will thank you for years to come for giving them this powerful resource! Just sign up below and we will send you the download link within a couple of minutes. After all, it\\\s your success we\\\ve been talking about! Ebusiness Rolodex ebusiness rolodex;emarketing;website 32209898 7.00 unlimiteddownload Fresh Download Available!